When it comes to the garden decoration, we often experiment with a lot of things. Those who are really fond of gardening especially take out some time for their garden and the garden decoration in order to make their garden look prettier. There is no doubt about the fact that garden decoration helps you make your place look really beautiful and appealing to others as well. Different types of plants, flowers, canopies, flower pots and decoration figures for the garden are certain things which prove to be a great help in garden decoration. A greenhouse is also an integral part of certain gardens and you can create your very own mini greenhouse if you are really fond of a greenhouse. You can enhance the beauty of your garden by adding an en extra amount of greenery through garden decoration. Here, a greenhouse or a mini greenhouse is a perfect way to do it. You can very easily create your mini greenhouse with the aid of the used soda bottles or any other drinks’ bottle. These bottles are obviously available at your place. As you are planning to make a mini greenhouse all by yourself, just do not forget to keep these bottles instead of throwing them away. You will need these bottles for your mini greenhouse. But one thing should be kept in mind that these bottles can be used but CLEAN. Make sure you rinse them out well before creating your mini greenhouse for garden decoration. After you have your hands on the clean soda bottles, you can start working on your mini greenhouse for garden decoration. The first thing you need to do is to puncture holes in the bottom. It is important to know exactly where to punch the holes and the right place to puncture your bottle is about 2 inches up from the bottom of the bottle. This step is done in order to cut the whole of the bottle through one side. This can be done through the help of scissors or sharp blades. Be very careful while performing this step. Once you are done with the cutting of the bottle, dispose the lower part or bottom of your soda bottle. 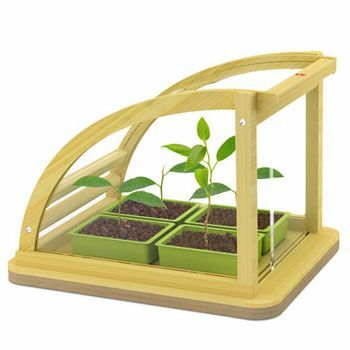 Now what you need to do is to make a planting pot in order to have the perfect mini greenhouse for your garden decoration. You will have to fill your planting pot with compost. In some cases, planting pot is replaced by a newspaper pot. These two things are almost same and both of them can be used. It all depends on what you feel like doing with your mini greenhouse. Now, push the bottle down on to the planting tray that you made previously and fix the bottle well into it so that it does not fall. It is best if you do not constantly keep on moving your greenhouse from place to place however, if you really have to do it then do it with the support and help of your hands. Do not forget to water your plants on a regular basis and your perfect mini greenhouse will be ready in no time and your garden decoration will be complete. Does Selena Gomez’s New Haircut Represent Something Deeper?